In an area where Indian restaurants seem to be popping up all over the place, it’s good to know that Bombay Babu really is one of the chiefs that shine out for all the qualities a chief should possess – excellence, consistency, reliability, style and integrity. Usually it is the combination of all these things that makes all the difference between a great meal and a dismal one. All of them work together to provide the whole experience – if just one of these is below par it can sometimes spoil the entire effect. Owner of Bombay Babu, Prakash, is aware of this so ensures his customers get the absolute best in every way possible, making sure that the whole experience, from start to finish, is as good as it can possibly be. This is obvious from the moment you enter the restaurant. The spacious terrace area is surrounded by luscious plants, and delightfully shaded by an interestingly-shaped awning. The tables and chairs are nicely spaced, well laid out, and elegant. Inside, the decoration has a graceful Bollywood feel to it, lighting is subtle, colours are delicate, and the whole effect is one of airiness and comfort. As Prakash always likes to stay one step ahead in providing the very best, there have been a number of changes at the restaurant lately. First and foremost the kitchen has been totally refurbished and is now better and, quite literally, much bigger than it was. This can’t make the curries any tastier – that would be impossible – but it does mean that the service is even faster than before. It is always comforting to be able to see into a restaurant’s kitchen, and to take a peek into this new one shows the care and attention to detail that epitomises the Bombay Babu’s attitude to their cuisine. Speaking of which, the brand new photo-menus, tastefully done and well labelled, show you exactly what you are ordering, making choosing your meal so much easier as well. Which is a good job as the menu is extensive and it’s sometimes not easy to decide which of the many delicious sounding dishes you should try next. There is far too much available to even begin listing here, but for a scrumptious example we could begin with the house special starter. The first thing you note when it’s brought to your table is the generous portions. Well, no, that’s not true, the first thing you notice is the mouth-watering aroma, but moving on….. the dish consists of several pieces each of onion bhaji, chicken barra kebab, chicken tikka, pudina tikka, vegetable pakora, sheekh kebab and chicken pakora – all with that delicious taste that comes from authentic Indian cooking. It’s the perfect example as it shows the quality of what you can expect – nothing is skimped on and no corners are cut, and this applies to all of the food – portion size is good and the curries are thick, rich and filling: packed full of fine ingredients. And so much to choose from: as well as the standard dishes there is a selection of curries which can come with a variety of ingredients, such as lamb, prawns or fish, and there are plenty of vegetarian choices too: all of Prakash's family are vegetarian so here is a restaurant that really knows how to cater for those who choose not to eat meat. The curries can also be made to various levels of spiciness, starting at very mild and working up through medium, <?xml:namespace prefix = st1 ns = "urn:schemas-microsoft-com:office:smarttags" />Madras and Vindaloo to Phall - which is only for those who really like it hot! Then there is a variety of sauces, rices, naan breads and chapattis to choose from, a children’s menu and even deep pan pizzas - traditional and curry based – and all of it smells and looks extremely appetising. Of course, wholesome and fresh ingredients are vital for a good meal, as the correct spices are fundamental for a curry. Several of the restaurant’s spices are imported directly from contacts in India and many of the ingredients come from the family’s organic farm near Las Galletas. 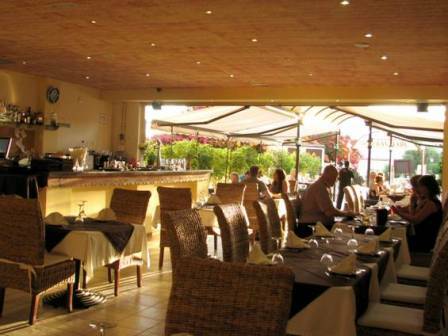 It’s no wonder the establishment has won awards for its cuisine – coming third out of 80 participants in the 2011 Tenerife Dining Awards. It’s always good to know other customer’s views as well – even a quick glance on Trip Advisor shows how well it is recommended and how many times it scores top marks for everything; and it comes as no surprise that it’s also the locals’ choice. Everywhere is completely accessible for wheelchairs and the restaurant is child friendly, with high chairs on hand, so no-one need miss out on their favourite meal as everyone is welcome. Banqueting, group bookings and birthday parties are all catered for and it’s great to see the restaurant also do their bit for charity: the recent Bollywood theme fundraiser in aid of Helping Hands Tenerife was a huge success. Partygoers got to dress in their finest, the Bollywood dancers were excellent and the money raised went to help disabled children in Guargacho. Now that your taste buds are tickled you’ll probably be delighted to hear that Bombay Babu is now open seven days a week. They will also deliver to anywhere between El Médano and Callao Salvaje and you don’t even have to phone your order through anymore – simply order online or from WhatsApp on your mobile, sit back and relax, and your food will be delivered to your door. Also, don’t forget to sign up on their website and be the first to know about their offers and discounts. Produced with news.CMS in 0,0855 seconds.